Another message from Deedy: not an elf in sight! 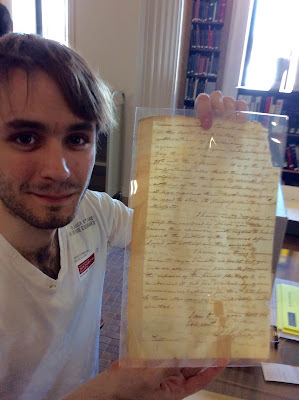 In my peregrinations with Julien Incher, the young Frenchman who is tracing the 1824-5 New England trail of General Lafayette, we made a stop at the New Hampshire Historical Society in Concord, NH. Librarian Sara Galligan was kind enough to allow us to look at the documents in the society's collection that pertain to New Hampshire's own Revolutionary General, John Sullivan. One of these documents was an actual letter written by GW to Sullivan on September 1, 1778. Because I knew a little of what this epistle related to, I found it to be absolutely fascinating. I will explain this in my next few posts. First of all, here is what I wrote about the situation in A Buss from Lafayette. Please keep in mind that the principal American commander referred to in this excerpt who was greatly offended was General Sullivan. As a result, he wrote a number of VERY angry letters complaining about the French. Joss and I exchanged a glance. Prissy said that although the French government had been sending us secret loans and supplies since 1776, the first overt aid they sent over was a fleet of warships in July, 1778. This French fleet was ordered to blockade Rhode Island to help the American commander, General Sullivan, dislodge the British there. D’Estaing, the French admiral, may have been rather offended at this, because no one had consulted with him beforehand about the planned venture. Our stepmother explained that before D’Estaing encountered the British squadron, he ran into a storm that damaged his fleet. Afterwards—again without consulting the Americans—the French admiral had sailed off to Boston to make repairs to his ships, which further offended our commanders. “I doubt the alliance would have worked in the end if not for Lafayette,” she concluded. “He smoothed down everyone’s ‘quills?’” I asked.